Micro-Tek Spray: a fast acting, anti-microbial spray that minimizes problems on contact providing leave on protection that continues to work for over 24 hours. It promotes a healthy skin and coat by controlling skin conditions while adding protein to strengthen damaged areas. This formula offers leave on protection to the damaged problem areas. Will not burn or hurt open wounds. Environmentally friendly. Accelerates healing. Alcohol free. NON-TOXIC. Micro Tek stops itching, effective and immediately for 24 hours. Can be sprayed directly on affected areas. Gentle care formula. Causes no burning, and promotes the healing of wounds. Once daily until the skin problems are gone. 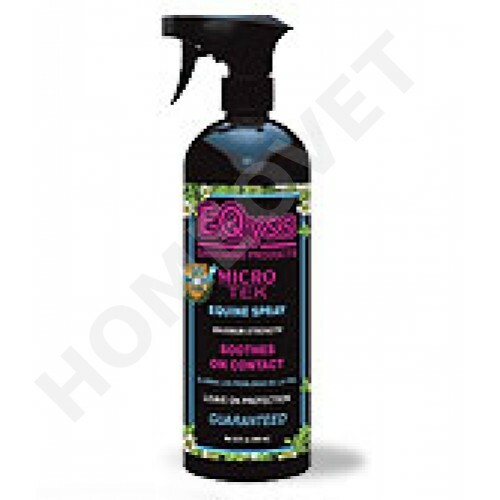 EQyss products are 100% animal cruelty free. Each product is of natural, herbal ingredients, manufactured by EQyss where ever possible. None of our products contain DEA.